Trading the dark cloud cover candlestick pattern can be very profitable, if done the right way. In this addition to my price action course, I’m going to show you how to correctly identify and trade this lucrative candlestick signal. This pattern is another moderately strong, two-candle reversal signal. You may have already read my previous article, Trading the Bullish Piercing Candlestick Pattern; the dark cloud cover signal is basically the bearish version of that pattern. I like to trade this pattern, because, like the harami patterns and the bullish piercing pattern, this pattern often leads to good risk to reward scenarios when it works out. Also, the bullish piercing and dark cloud cover patterns are fairly common, providing candlestick traders with plenty of opportunities to test their skills and earn a profit. 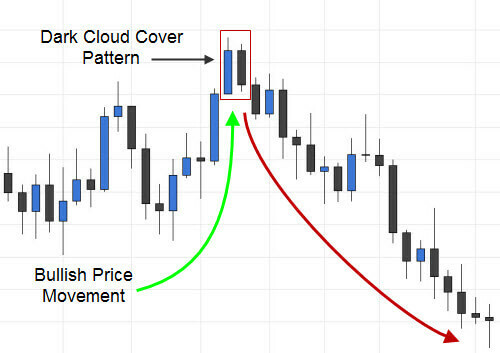 What is a Dark Cloud Cover Candlestick Pattern? The dark cloud cover pattern is a moderately strong, bearish reversal signal. 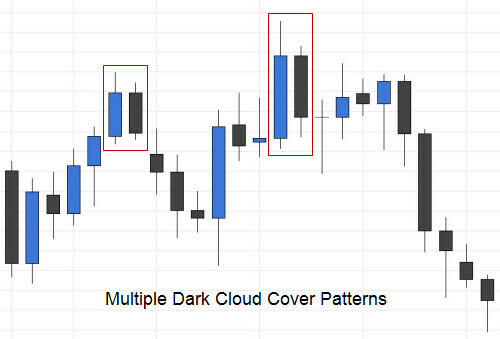 Like all bearish reversal signals, a true dark cloud cover pattern only occurs after an uptrend in price. Steve Nison (the authority on candlesticks) says that a trend in price, as it relates to candlestick trading, may consist of just a few significant candles in one direction. This pattern consists of a relatively large bullish candlestick, followed by a bearish candlestick that closes deep into the real body of the first, bearish candlestick. The second candle in this pattern should close somewhere lower than the 50% mark of the first, bearish candle’s real body (see the image below). 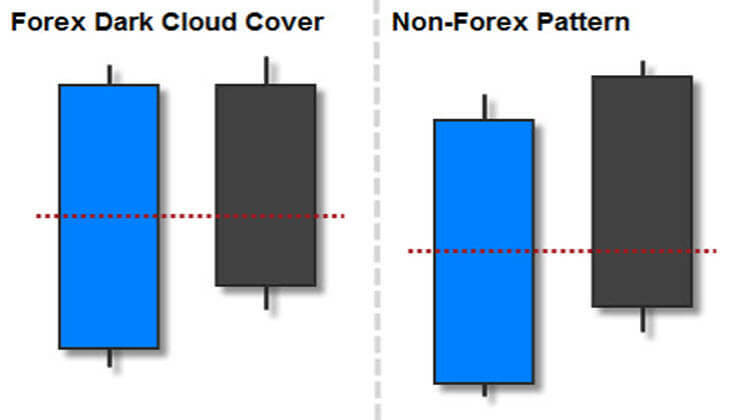 A non-Forex dark cloud cover signal is similar. The only difference being that the second, bearish candlestick needs to open above the close of the first, bullish candlestick; so there should be, at least, a small gap up before the second candlestick closes deep into the real body of the first one (see the image above). In Forex, a gap up to the second candle’s open is not necessary. The extreme liquidity of the Forex market (especially in the major pairs) ensures that there are rarely gaps in price from one candle to another. Note: You may come across a dark cloud cover candlestick pattern that resembles its non-Forex counterpart (second candle opens above the close of the first candle). Although this is a rare occurrence, it is usually a very strong bearish signal. In the image below, you can see a nice dark cloud cover pattern that signaled a major reversal. This one would have worked out nicely, and you could have made more than five times your risk. You might also notice that this reversal was so strong that it blew right past the bullish engulfing pattern that formed eight candlesticks later. Of course, upon seeing the engulfing pattern, that would have been a great place to lighten up on your position, even though it was mostly ignored. In the next example (below), you can see multiple dark cloud cover patterns. The first signal could have earned you about twice your risk. You can see from this example, however, that candlestick signals are often very short term indications of where price is headed. The second signal, although it worked out, wasn’t looking quite as promising upon setup. The upward price movement that preceded that signal is not significant enough for my comfort; there were really only two bullish candlesticks making up that trend, including the first candlestick in the dark cloud cover formation. Also, the risk to reward ratio on that second signal wasn’t looking too great because of the large candlesticks that made up the second pattern, along with the tall upper shadow of the first, bullish candlestick in the pattern. Even though the reversal that followed was much more significant than the first one, you still would have only made about twice your risk. Note: Steve Nison recommends not taking trades where the distance to your first support area is not, at least, twice that of your risk. In the example above, the second signal would not have qualified, as the first support level is the preceding cycle low in price. In the next example (below), you will see another dark cloud cover candlestick pattern. The uptrend that preceded it wasn’t much of a move, but considering that all the candlesticks in that trend were bullish, and they each made slow but steady progress upward, I would have considered this move significant enough to count as our qualifying uptrend. One thing that a discerning price action trader may have considered is that the candles making up this dark cloud cover aren’t particularly large. They are, however, relatively large when compared to the candles that make up the preceding uptrend. The example above is a perfect demonstration of why you should always seek, at least, twice your risk to the first support level (on bearish trades). As soon as price reached the previous cycle low (our first support level), it reversed again without much notice from the candlesticks – other than a couple of long lower shadows. The traditional confirmation entry happens when price breaks the low of the second candlestick in our dark cloud cover signal. The only other option is to enter at the open of the new candle. Your stop loss should be placed above the highest high in the pattern (remember to add the spread in Forex). As with any bearish reversal signal, a true dark cloud cover candlestick pattern only occurs after an uptrend in price. Trying to trade these candlestick signals from periods of price consolidation in the market is never a good idea. In non-Forex markets, remember that the second candlestick in this pattern needs to gap up slightly before closing deep into the first candlestick (lower than the 50% mark of the first candlestick’s real body). Due to the extreme liquidity in the Forex market, a gap up is not likely, although if it occurs, it is a very strong bearish signal. 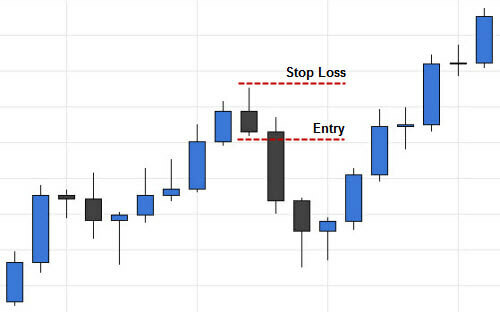 One of the beauties of candlestick trading is that it can be added to just about any trading system that you are currently using for more trading opportunities. Using a reliable, profitable trading system can help you qualify the best candlestick signals to take. Trading the dark cloud cover candlestick pattern can be very lucrative, if you know what you’re doing. Never risk your hard earned money trading these signals live until you’ve become an expert at trading them with your demo account (or paper trading). With a little practice, you’ll get a feel for this pattern, and you’ll be trading it like a pro in no time. I don’t understand this statement: the distance to your first support area is not, at least, twice that of your risk. Could you please explain a bit more? Regarding the example in the last picture, if you measure from the entry of the dark cloud cover to the candle body lows of the previous cycle low, that distance is not quite 2x the amount of pips at risk. In other words, if you are risking 25 pips, you want to be able to get, at least, 50 pips before running into any possible support, such as the previous low. The setup in that image is actually a bad example of this pattern. Most successful price action traders would have skipped it, although it did work out.